Welcome to the Ascent Technology 2016 Year End Newsletter, a year which has certainly witnessed its fair share of interesting developments, globally and locally. Aside from the surprises delivered by the UK’s Brexit referendum and the US election result, we have seen many changes to our own status quo, following the local government elections in August. Irrespective of these surprises, this year has been very similar in other respects to 2015, with the global and local economy continuing to struggle and cost cutting measures and consolidation procedures seemingly becoming a way of life. This, naturally, has led to an increasing number of clients recognising the value proposition offered by Ascent Technology, with regard to its Co/Outsourcing model and the cost effective, economies of scale resourcing and skills, benefits this model delivers. While there is little doubt that the past year has had its share of challenges, there have also been some memorable moments, trends and milestones, of which we would like to share a few with you. As already noted, there are a number of challenges that are currently impacting on our and other industries, creating what amounts to a tough operating environment. Ascent has chosen to overcome these difficulties through a continual focus on its critical areas of strength and growth. In this respect, we have spent the past two years developing our national footprint by leveraging off our relationship with the First Technology Group, which has enabled us to compete on a larger scale than ever before. We now have a presence in key regions across South Africa and have thus turned our attention to the next area of growth, by focusing our latest expansion plans on the international arena. 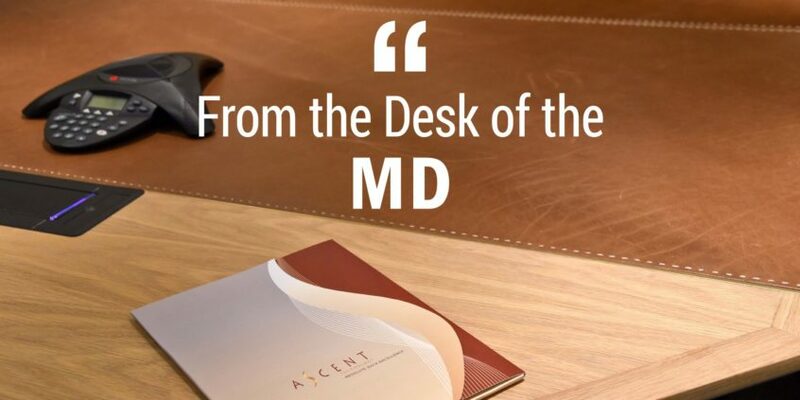 As a first step into the global market, Ascent is expanding into the Middle East and Africa (MEA) region. To this end, we are in the final stages of opening up a regional office in Dubai that will deliver the same levels of end-to-end cost effective, Managed Database Consulting and Support Services that our local clients have become accustomed to. Not only will these new offices give us access to a larger international market, but they will also be ideally positioned to enable us to service local clients that are themselves expanding into other areas of the continent. In this way, we are able to broaden our own scope while also delivering additional value to a number of our existing clients. Ascent will officially announce the date of the new Dubai office’s opening early in the New Year, so keep your ears open for this news. When it comes to cloud computing, there can be little doubt that the initial hype cycle around this technology and business model is well and truly over. Today, cloud computing can be described as being part of ‘business as usual’. It is, after all, integrated into much of what we do and is now a mature technology and business model. Cloud computing is certainly part and parcel of what Ascent does and is now an integral part of our operations and services. Despite this, we are aware that different clients remain at different stages in their own cloud computing adoption journeys. As such, Ascent is well positioned and committed to assisting these clients in whatever manner they choose to walk this journey – be this private cloud, public cloud or a hybrid of the two – and to helping these clients to unlock the additional value this journey will bring to their organisations. Ascent remains committed to building skills in the industry and to developing youthful talent, as evidenced by the fact that we have just completed our 10th Microsoft Internship Programme. This means that we have been involved in skills building for a full decade now, and through this programme have managed to deliver continuity in skills and expertise, something that remains vital to Ascent and its clients. In tough times like these, it becomes more crucial than ever for organisations to come together to help boost job creation and afford the youth of today an opportunity to enter the ICT space. By continually developing a new generation of highly skilled individuals we create new opportunities for youngsters to enter the marketplace. Ascent is proud to have been able to play its role in kick starting the careers of graduates and offering genuine value add to our clients in this manner over the past ten years, and we look forward to a new decade of skills building, beginning in 2017. To this end, we have already started the on-boarding process for our 2017 Internship Program, we welcome our four new learners and wish them the greatest success in their new careers. Over the past year, we again have focused stringently on building on our successes, in order to continue providing our clients, with the service and value they have become accustomed to over the years, this while managing to steadily grow as a business. However, we are well aware that our continued success in this is only due to the strength of the partnerships we have with our clients and our principles whom, along with our people, are the most valuable aspects of our business. And thus, I once again would like to extend my most heartfelt thanks and gratitude to every one of Ascent’s clients, principals and people, both old and new, for your continued support. We value and appreciate the role each of you play in this journey we are on, and we look forward to continue building on these relationships in 2017. In closing, we would like to wish you everything of the best for the Festive Season and we trust that whatever you are doing over the December period, it will afford you the chance to rest and relax. We look forward to welcoming you back safe and sound in 2017, so that we can kick off a new and fruitful business year together.